Elizabeth Rooney's prints often express her strong views on urban and rural conservation issues. 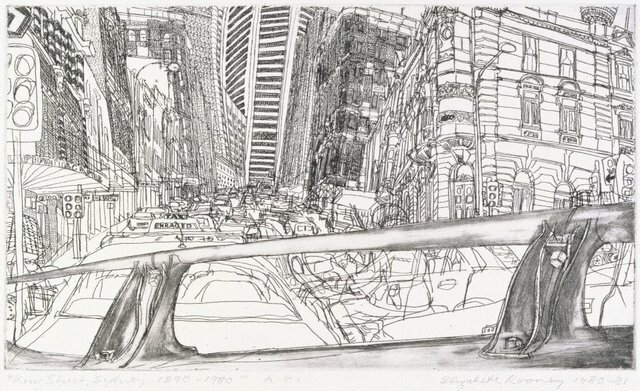 The development of Sydney is a recurring theme in her work, as is 'revisiting' a site to show the changes wrought upon it over a period of time. Subsequent states of an image, through re-working the etching plate, is also a common feature of her prints, which reveal further changes in her subjects; Rooney has documented the changing cityscapes of Sydney and Newcastle over the last thirty years, leaving a poignant and often humorous record of lost or threatened landmarks.